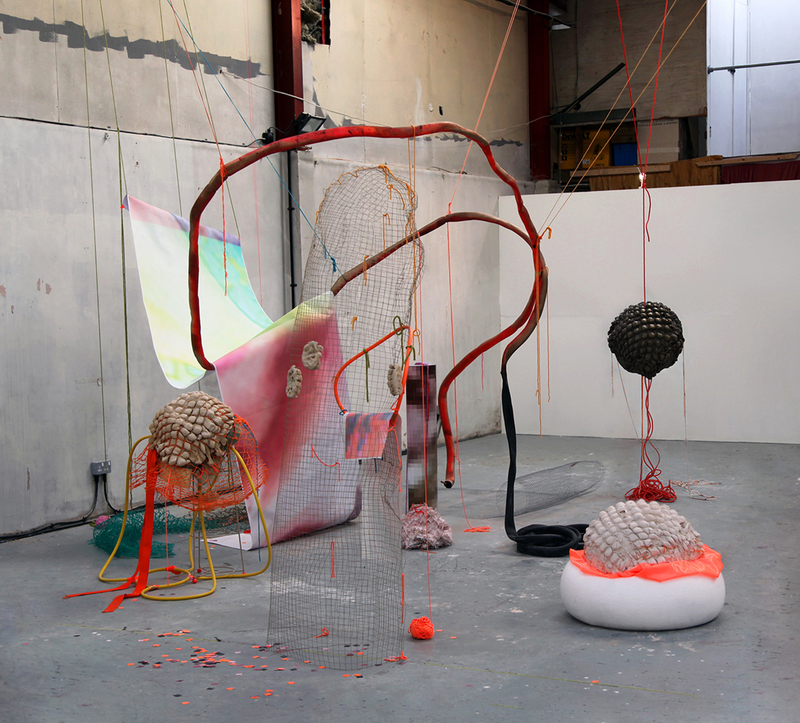 Emily Motto is a multi-award-winning artist working in sculpture, installation and drawing. She studied on the Foundation Diploma in Art and Design at Central Saint Martins and went on to study BFA Fine Art at the Ruskin School of Art, graduating in 2014. Motto has since exhibited at galleries including the ICA London, Pangaea Sculptors’ Centre and Beaconsfield Gallery Vauxhall. She was also visiting artist for the Art Inspiring Change learning programme at Turner Contemporary, Margate 2016–17 and has taken part in residencies internationally including Rome, China and Jamaica. At the moment I’m building lots of things with cardboard and cement and have been making sculptural forms and organising them in spaces – in these kinds of arenas and mazes. I like the way exhibited works play between sculpture and drawing. Last year, I was making work in a studio on a farm in Orpington, and I just finished working on a commission called Holdfast at Chalton Gallery, before coming to Jamaica for a residency a few weeks ago. When did you first realise that you wanted to create sculpture and installations? On foundation, I choose the sculpture pathway within the Fine Art curriculum area. I feel that most of my work has been a continuous exploration which follows on from things I started making then. I remember a “room” project which made me think about space in a really open and malleable way – and I think have been playing with that ever since. Your work is very playful and colourful, often using unusual materials like bread and handmade playdough. Can you tell us more about your material choices? A lot of it stems from initial experiments with things I find, seeing what happens and what I’m drawn to. With the bread in some of my recent works, the yeast reactions expanded the dough I was making into new forms. This is something I like with a lot of my work – seeing how the materials lead the shapes, textures and colours to change and adapt into something else. I love surrendering parts of the making process like this, to properties of the materials I make or choose. At the moment I’m really enjoying playing with cardboard when it’s freshly painted with cement and is still soft. Right now, I’m in Kingston, Jamaica, working on a residency at the artist-run initiative New Local Space. I've been playing with lots of different cement and grout mixes and pigments I found here and experimenting with structuring large, thin paper shapes. I’m also working on something for the Potting Shed at Contemporary Sculpture Fulmer, organised by Collective Matter, which I’m looking forward to when I get back to London later this year. How would you describe your experience on the foundation course at Central Saint Martins? I remember it as one of the best years; it was quite overwhelming and amazing being with such a large group of people who were all so creative. I really enjoyed being able to try the different pathways and to see what everyone was making. It was my first experience of spending all my time making art rather than balancing other school subjects too, which I absolutely loved. I remember I found it very difficult deciding whether I wanted to be in the sculpture or painting pathway at the time. I think one of my deciding reasons really was Pulp’s “Common People” – it was that close a call! To keep an open mind. I don’t think I expected to choose the sculpture pathway when I started. I also took a lot from the experiments in other pathways during the diagnostic phase – especially in textiles and film – which I definitely still carry in the work I make now. I actually wanted to apply straight to a BA course from A Levels at the time – just impatience I think! But, I was so glad that I spent the year doing a foundation first. It is a big change going from studying school subjects to making art all the time. Foundation was fast-paced and experimental – it was a place where I felt free to test things out without any pressure, which was a really good way to start. It was also a place where I made friends for life. It’s especially interesting to see the different courses and paths we’ve all taken since then and to collaborate together on things now.